TIMUR IBRAGIMOV: "We show everybody that we can fight too"
Why do you think so many of the Eastern Bloc fighters are making an impact on heavyweight boxing? Ibragimov: It is very good for us. Before, I was sure that the best heavyweights came from America. Mike Tyson, Muhammad Ali, Larry Holmes, George Foreman, and now the latter champions are coming from the former Soviet Union. I don’t know what has happened, but we show everybody that we can fight too. I think it has changed because when you ask anybody who the best one is, they say Klitschko or somebody else, but they never say an American. Before yes, but no now. Does the freedom that you now have make a difference? Ibragimov: Maybe, but you know what? I think the former Soviet fighters have experience from amateur school. Maybe this is a point for us because a lot of American heavyweights do not have amateur experience. When I was amateur, I was not heavyweight – I was cruiserweight. I fought in the Olympics in Atlanta and I fought in the world games in Berlin. I fought in the Asian games. I fought in over 200 amateur bouts. I won close to 180, maybe 170. Ibragimov: Yes, if you see Klitschko, he had a lot of amateurs also. 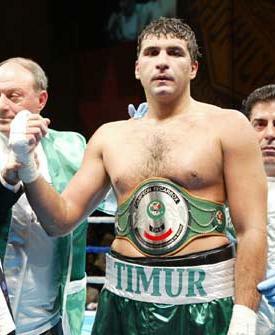 Only Valuev, he doesn’t have too much amateur experience. The young guys from Germany too. Everybody has a lot of amateur experience. These are the points, but that is just my opinion. Germany is vying for the big fights and they are going there too. What do you think of Calvin Brock? Ibragimov: He is a really good fighter. He’s got heart and everything but he is really nothing special. He is like anybody. Do you think Maskaev will beat Rahman to make a clean sweep? Ibragimov: This is a difficult question for me. You don’t know what happens tomorrow, right? Me either. What I do know is that Rahman has trained very hard for this fight. This will not be a fight – it will be war. I do not know what will happen, but I do know they both prepared very hard for this fight. What about your fight, what are your chances? Ibragimov: If I did not think they were good, I would not get in the ring. What happened to the American heavyweights? Ibragimov: I do not know. Some people say they are not hungry right now. You see Rahman and James Toney, they are good fighters, but the Soviet fighters, they train like they are in the army. You get up in the morning and run. Even if you don’t have a fight – you get up and run. American fighters, they don’t do that – only when it gets close to the fight. I have a lot of friends in Germany and it is like they are living in the army. The Cuban national team? They live like they are in the army and they win four medals every time out. What was the difference when you turned pro? Ibragimov: When I see the gloves? They looked small. When I fought the four round fights, there was not much difference but I could really tell when I fought eight-round fights. The most difficult is that it is not 4 rounds, it is 8 or 10 rounds. In Asia, if the fight is hard, they quit – in America, they keep coming and coming. We prepare for twelve rounds. If it ends early – it is good. If not, I prepare for twelve rounds. Brock outpoints T. Ibragimov; Quintana defeats Julio! Undefeated . . . But Not For Long!